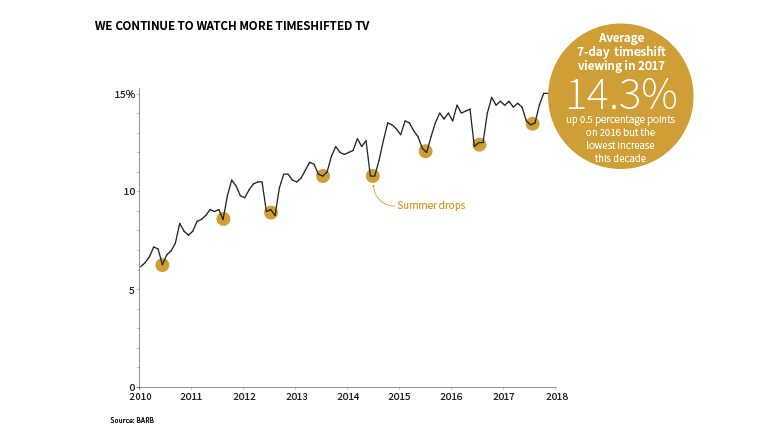 Timeshift – how much timeshifted television did UK viewers watch? When and why did timeshifted viewing peak and dip? Which genre was the most timeshifted? And which demographic and region were responsible for the most timeshifted viewing? Share by genre – How did the genres rank by share of total TV viewing? Which genres saw significant increases or decreases in their share, and why? 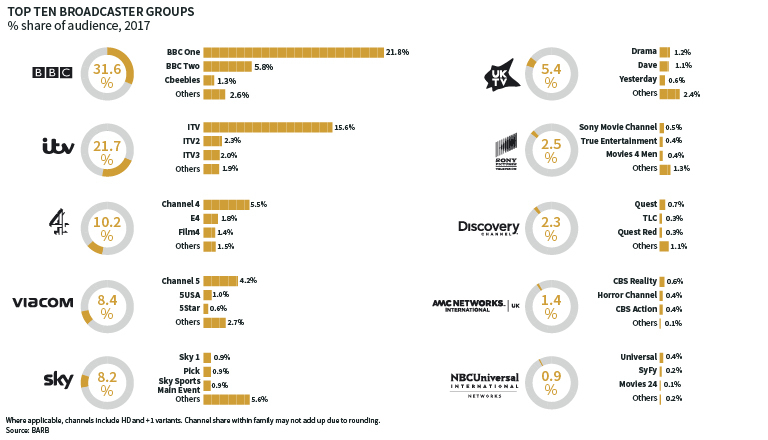 Share by broadcaster – How did the major broadcaster groups rank by share of audience? Which of their channels had the highest share? Here we’ll find out the answers to these questions for 2017 viewing. For further updates on viewing trends, check out the Trendspotting tab, which features quarterly trackers of metrics such as device access, SVOD households and UK households by TV platform. We continue to watch more timeshifted TV. Average 7-day timeshift viewing in 2017 was 14.3%, an increase of 0.5 percentage points on 2016 – but this was the lowest increase this decade. As usual, the summer months saw a dip in timeshifting, although with the absence of a major international football tournament or Olympic Games this dip was smaller than in previous years. With timeshifting more stable across the year, it is possible that audiences are turning their attention elsewhere. We know that unmatched viewing is growing and can surmise that SVOD services account for a large part of that. Netflix, Amazon and Now TV may be impacting timeshifted as well as live viewing. In 2017, drama retained its place as the most timeshifted genre. Adults 25-34 and the South & South East and London continued to be the demographic and regions doing the most timeshift viewing, likely a reflection of time-poor professionals with young kids and long commutes using timeshift to catch up on their favourite shows. In 2017, four unlikely characters have come together to influence our viewing habits: President Donald Trump, David Davis MP, Syrian President Bashar al-Assad and Prue Leith. They are all central characters in helping the factual television genres (documentaries, news/weather and current affairs) reach a 29.3% share of viewing – more than a four-point increase since 2014. Sport’s share of viewing fell, as expected in an odd-numbered year, while the children’s television market continues to struggle, with the genre dropping another 0.4% to follow the 0.5% fall in 2016. As children’s unmatched viewing grows (reaching a daily average of 53 minutes in 2017 from 43 minutes in 2016) we may be witnessing the impact of SVOD services, such as Netflix, exerting downward pressure on viewing to linear children’s programming. The FIFA World Cup will undoubtedly see sport bounce back in 2018, but another genre showing strong growth in 2017 was entertainment. Strictly Come Dancing, I’m a Celebrity and a plethora of reality entertainment shows have driven the genre forward in 2017. 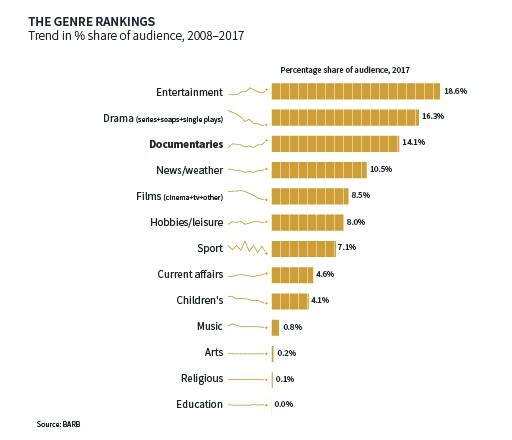 Documentaries were the fastest growing factual genre, increasing their share by 1.1 percentage points to reach 14.1% – the highest level this decade. This was in no small part down to BBC One’s Blue Planet II. 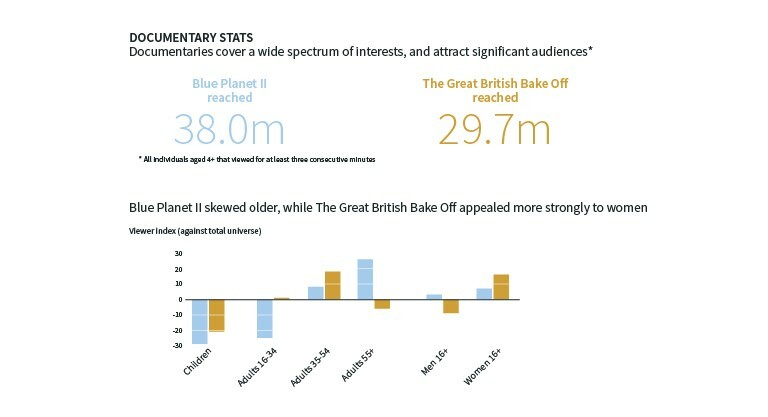 Below we take a look at who these viewers were compared to the next biggest show broadly defined as a documentary – Channel 4’s The Great British Bake Off. Looking at the top ten broadcaster groups by share of viewing in 2017, the top nine remain unchanged on 2016, with Viacom and Sky swapping places as Viacom moved up to fourth place. The two remain very close in share, separated by just 0.2 percentage points. The main change sees NBCUniversal International Networks claim the tenth spot in the share ranking, with 0.9%, displacing Turner which held tenth place in 2016.